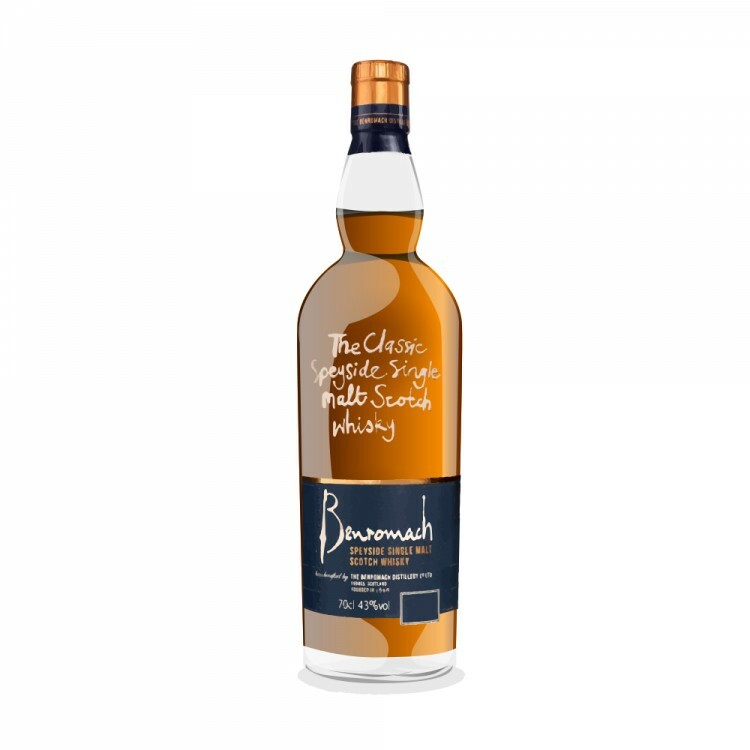 While Benromach has won over many with their old school style malt, it hasn't quite stirred up the frenzy that each Springbank release has caused. It might seem unfair to compare them but I believe them to be related in many ways. Family owned, longer fermentation styles, less automation, good cask policy, both are the distilling arms of Independent bottlers. The 10yr old and it's Imperial strengths counterpart are confirmed winners, let's dive into the range. This 2006 Peat Smoke is part of what they've dubbed their contrast range, peated malt in the 67ppm range (no source listed), first fill bourbon casks, 46%, no mention of chill filtration though. Nose: Farmy, earthy peat when first poured, then abruptly a surprising note of pears, apricot paste, it's very unusual. Underneath all of that the it's very close to the grain, a touch of old lemons, glycerin & talcum powder.The smoke is there but not overwhelming once it subsides there is a bit of oak and vanilla but surprisingly isn't dominant for a first-fill bourbon. A nice nose, very round, the peat doesn't dominate. Palate: Sweet, dark, jujubes, that instant peaches & cream oatmeal with smoke blown over the top. There is a bit of citrus, linseed oil & powdered sugar with loads of grain and a touch of oak, the texture is a bit thin. Finish: It keeps bouncing between earthy tones, plantain, mezcal and a strange sweetness, almost artificial, like those swirled strawberry and yogurt candies. The oak is most present at the end. It's a nice take on the genre (young heavily peated bourbon cask) its different than the Islay style in that it has no maritime influence but I think it's much closer than peated whiskys by Glendronach or Balvenie for example. Yet it's not distinct enough, it doesn't really pull you in like the 10 yr old,perhaps if it was at higher proof like some of their single barrel releases it would be more effective. Nice review. At basically the same price, this one doesn't seem to compel a departure from the regular 10. @RikS it's worth trying especially in a flight of peated whisky or if trying to understand the difference between Islay peat and Speyside peat for example. The 10 yr old is a tough act to follow, it's a testament to how well it's vatted. That is an informative and helpful review - thanks. I also make a similar comparison between these guys and Springbank. I too am finding the differences between peat from different places interesting. Very helpful review @cricklewood. 83 points does not compel me to invest in a bottle, but I would love to try a sample out of sheer curiosity. At a similar price point I would always opt for the standard 10. I still prefer it to the slightly bitter edged 100 proof version. @Hewie it's still an enjoyable dram and might rate higher for some folks. It's my girlfriends bottle but I don't think either of us would replace it's more expensive than the 10 in our hood. I did enjoy the wine cask variants I'll post a review of one soon. I would love to try the triple distilled version of this to see how it affects the distillate. I just checked and it's this version of the Ben peated I have and plan to open soon. Looking at your review (and others) it seems that they are good but not great. I'm generally not the biggest lover of non-Islay peat bombs but do like the peat style in BRs. It's been in the stash for over two years now though and the time is nigh. I seem to remember ralfy scoring a version of this quite highly? @RianC I am going to admit that I probably have started grading things a bit more severely in the last couple of years, in reaction partly to how many middling whiskys there are out there but also my dissatisfaction with the ability of the grading systems in general. I am going to digress a bit here but isn't funny how no one talks about Serge's SGP rating (the numbers next to his actual mark), it's really kind of a brilliant annotationbut doesn't get the attention it deserves. It's a pretty good whisky, the first we're big and really smoky, the final drams exhibited a nice mineral side that had taken more place. It's unique but I find that the 10 yr old is a tough act to follow. I wouldn't regret buying a bottle but don't think I would buy more than one, does that make sense. As for marks . . . I often think I'd prefer to mark out of ten with maybe the odd .5 in there. Many whiskys I give in the mid to high 80s would be solid 8s but lower 80s would be 7s. So why not mark like that then? Well, seen as we're asked to mark out of 100 it would be odd if I marked everything 60, 70, 80 or 90 and those extra points simply reflect my level of enjoyment with a whisky over the time I've spent with it and how I'm finding it on the day. I think I mark generously but tend to review and score when I'm in a good mood. If I reviewed when grumpy a 40 year old Ardbeg would be lucky to get 80 As ever, consistency is really all that matters. As for Serge - I've often wondered what those SGP points were for. What are they? @fiddich1980 thanks for those links. I had just assumed that those SGP numbers were some sort of search code. I didn't actually realise that they were a rating system. i really like it - it gives a nice overall indicator of the profile rather than just a score of how god it was too you. I'll have to go back to some of the bottles I've looked at previously and take not of their SGP rating. Shame it hasn't taken off in other places on the net. @Hewie, the SGP code is a brilliant innovation that has been around for more than a decade...but...posted reviews from the recent blind tasting sponsored by @fiddich1980 show the diversity and variation of interpreting these SGP properties. A great tool; however, your taste must be aligned with the reviewer.